The Karate Thoughts Blog has a piece on tournament kata that caught my eye. While I agree that kata "is a rehearsal for an unfortunate, grave situation" I believe that there's more to these ancient forms and as a former competitor I'd like to offer my two cents. Kata translates as "form" and on a certain level are artistic in nature. Aspects of aesthetic form includes maintaining correct stances throughout, proper foot alignment, looking before changing directions, and the execution of clean and precise techniques. In a good kata performance there should be a certain amount of gusto or passion evident but not so much that it becomes distracting or annoying. Most rulebooks on kata competition advise that judges should penalize competitors for trying to enhance kata with gymnastics or other crowd pleasing tricks such as too much or exaggerated kiai. According to AAU karate rules, the kata must be performed with competence and must demonstrate a clear understanding of the principles it contains. Trying to convey a "clear understanding" of principles from swatting air seems like a tall order. How can anyone tell what the performer understands in the kata from a mere performance? Does an overly dramatic performance of kata necessarily imply that the practitioner is ignorant of the form's applications? I'm generally in favor of tournament kata because it gives the practitioner the opportunity to perform and test out skills in an unfamiliar setting. But putting too much emphasis on trophies and even aesthetics can be an obstacle. 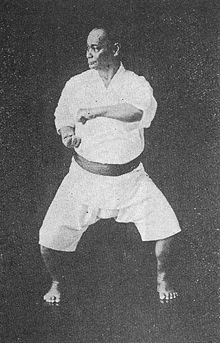 Kata without an understanding of its self-defense applications (bunkai) are worthless. At any rate, when performing kata one should be engaged enough to convey a serious attitude sans the dramatics, while at the same time light enough to enjoy what you're doing. I see nothing wrong with that.